A bright crisp morning and we’re off again. Not as organised this time. On arriving at the storage site to hook up we realised that we’d left the caravan step in the boot of our other car. Having visited the caravan last week taking some bits and pieces to it and of course having a cuppa whilst there, the heavens had opened and not wanting to put a very wet step into a nice dry caravan we stored it safely in my boot, vowing that we would remember it was there. Which, of course, we didn’t. We hooked up, set off in the direction of home, where I was to jump out at a convenient spot and run back to the house to collect the missing step. A series of temporary traffic lights and roadworks near home meant I had to be quick as there wasn’t really room for hanging about with a caravan on the back of the car. Step stowed safely in the car off we went. The sat nav was showing 70 miles to our destination. At this point we decided we should really give them a call to book a pitch, I told you we weren’t organised. Pitch booked, 66p service charge on a credit card payment and the next couple of days were sorted. 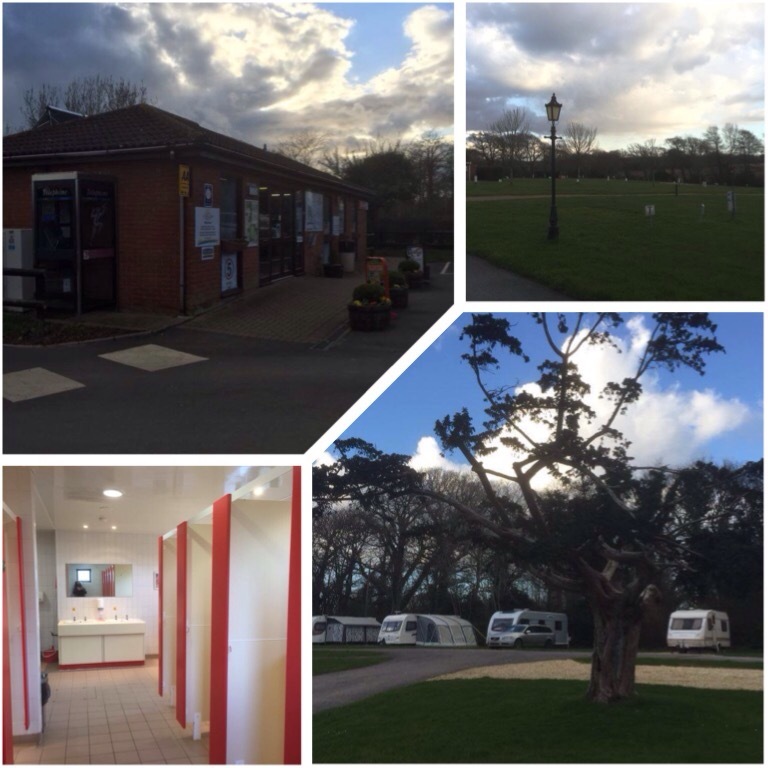 Lytton Lawn, a site in the New Forest, was recommended to us by a Hymer Motorhome owner on our last visit to Sandy Balls. A little bit further than we normally travel for a two night stop but still do-able. We had been warned that on arrival reception may be closed as the wardens were possibly out and about working to ready the site for the fast approaching Easter break. Reception was closed, a notice informed new arrivals to check the notice board. Before we could read the notice board two lovely wardens came from out of nowhere, greeting us and unlocking reception. We were given a hard standing, fully serviced pitch. We are getting to like these pitches, rigging up pipe contraptions to carry our waste water away directly. We do need to invest in a mains water adapted kit to benefit fully from this type of pitch. The site has grass, hard standing and full serviced premier pitches and is really well spaced out with trees dotted about. Some of the grassed pitches were sloping and chocks would be needed. There is also a 10am departure time on your final day, as it was very quiet we asked if they could be lenient, they let us stay until 11am. Through the trees if you squint you can see the sea. 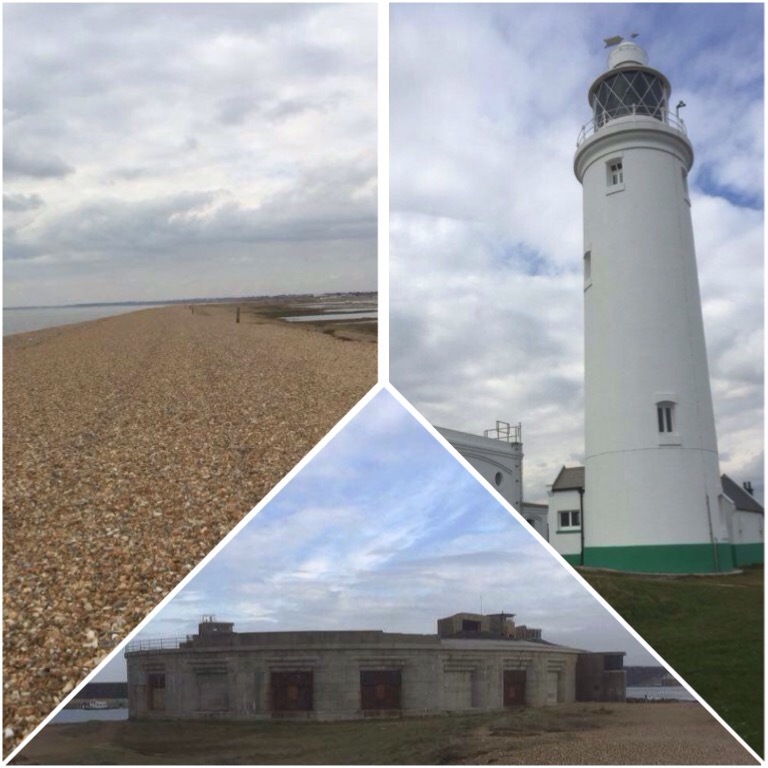 Situated just a hop, skip and a jump outside of Milford on Sea it is pleasantly located. The signage at the entrance proclaims the site was founded in 1958. Nothing on the site has been there that long. With 2 facilities blocks, only 1 of which was open due to being out of season, you really can’t complain. The block was very modern and clean comprising of toilets and showers, no privacy cubicles, laundry, chemical disposal, inside washing up area, games room and recycling points. With an extremely well stocked shop and access to use the facilities at the nearby Shorefield Country Park. The onsite wifi is located in the games room, which being out of season was locked but the wardens pointed out that wifi could be obtained a short distance outside and may reach our pitch if lucky. On the ‘wifi’ subject. 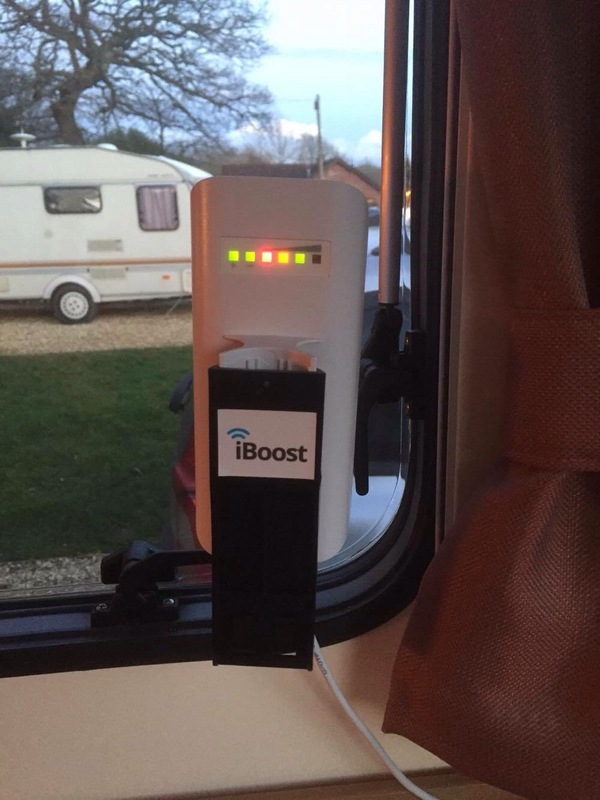 We recently purchased a wifi booster from Motorhome Wifi with internal router which in theory can receive a wifi signal too weak for mere PCs/tablets/mobile phones and then all those aforementioned items then link to the router via the password on the router – it worked – hoorah. None of our gadgets could see the site wifi but the wifi booster did. This type of system is well worth considering if you like to stay connected. It could even help you gain access to free wifi in certain circumstances but multi gadget use without constant ‘sign in’ is a real bonus, especially on caravan club sites. It’s still no good if wifi signal is too weak, ie. We could not get it to work at Sandyballs, but there is a 3G/4G equivalent gadget in this situation. Starting to sound like a salesperson now, but this info could be of interest to someone new to the scene. The following morning dawned crisp and fresh, by this I mean bloomin freezing. The grass looked like it had been sprinkled with icing sugar. Blue skies though with a sunshine threatening to melt the world once it had rubbed the sleep out of its eyes. Cup of tea in hand, cereal or should we try out the new Teppanyaki? Bacon butties it is then! It cooked the bacon to perfection, point to note though, it may be best used outside in future as space inside the caravan is limited, it spits like a frying pan. Bellies full, time to venture out. We jumped in the car for the short 1.5 mile into Milford on Sea and paid £3 for 4 hours parking. Walking 10 minutes down Sea Road and we reached, have you guessed yet, the sea. Immediately we were presented with a sunbathed view of the Isle of Wight and probably the clearest view of The Needles you will see from the mainland. We headed East up onto the shingle bank that forms Hurst Spit, a 1.5 mile spit that forms a coastal defence and protection for the mud flats and saltmarsh areas within. At the end of the spit stands Hurst Lighthouse and Hurst Castle, apparently built by Henry VIII in honour of Geoff Hurst’s hat-trick in the World Cup Final, oh dear, I really hope no gullible Americans read this blog. The 1.5 mile walk is all on shingle, approx 50/50 hard packed/loose packed so takes a little effort and best in walking boots. We were able to circumnavigate the castle, best described as a fortress really, but had to climb a 7 foot vertical laddered sea break at one point and the sea was within 1 foot of the castle wall at another point on the ‘sea side’, but you can walk the opposite way if this sounds awkward. We could not enter the castle as it was closed and opens March 25th through to end of October (£4.80 adults, £3.00 children). Unfortunately there was no Wetherspoons or McDonalds next to the lighthouse, but hey-ho Rome wasn’t built in a day, so we settled for a sit on the shingle bank at the narrowest point between the mainland and IOW watching a small ship seemingly on full power struggling against a fast and powerful outbound current. Once the castle opens, it seems there is a small, bit bigger than a dingy, ferry service from the castle back to Keyhaven which is a shorter and probably interesting route back to Milford on Sea. 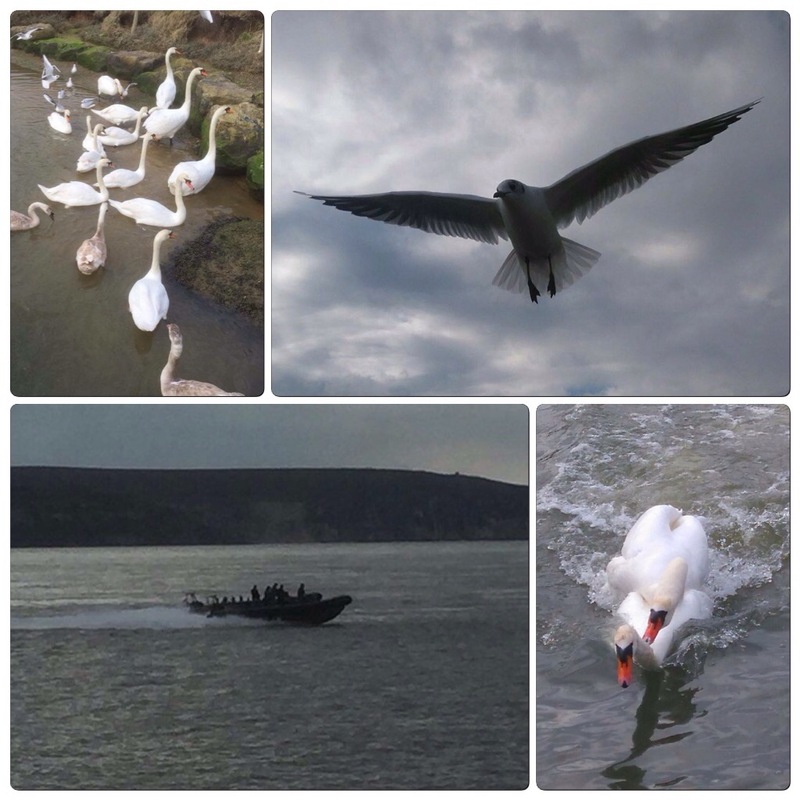 As we did not have this option it was back down the shingle bank with the occasional distraction of Navy speed boats and Swans fighting/reproducing (delete as appropriate) as we were dive bombed by Gulls. 2 Teas and 2 Rock Cakes later at the promenade cafe and it was back to the car, via the local shop where 3 beer bottles and a wine bottle forced themselves upon us. Back to the caravan for a well earned cup of tea and a little nap. So, to summarise, would we go again? The answer is most definitely ‘yes’. It is probably a site that we would use when all the little darlings are in school. As a site it’s very family friendly, small play area, outside table tennis table, children’s playing field and a games room. All with free access to the local leisure facilities. 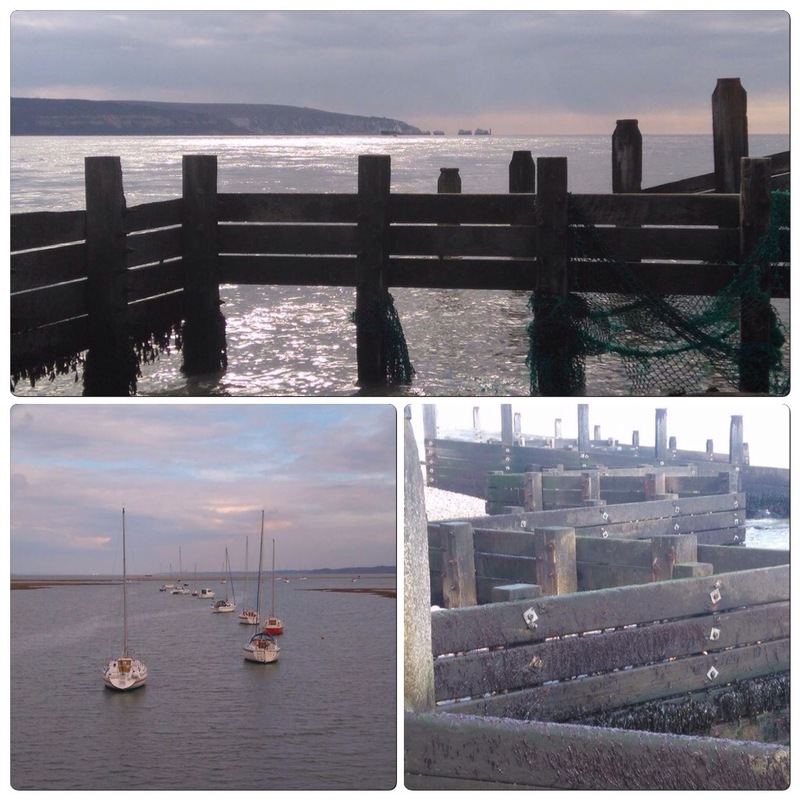 Out of season or during the week in term time, it offers peace and tranquility in a lovely part of the country with the countryside and seaside all on your door step.